A frequency inverter is an electrical device used to control the speed of a standard three-phase induction motor. A frequency inverter allows you to conveniently adjust the speed of a motor by changing the frequency applied to the motor. So, for convenience, cost-efficiency, and precision, a frequency inverter changes the frequency (and voltage). At any given frequency output of the inverter, you get a new torque / speed curve from the motor. 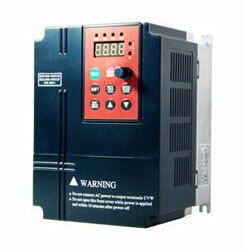 Note: This frequency inverter is for controlling AC motor speed ONLY, also named variable frequency drive. In case you are looking for 50 hz to 60hz (vice versa) converter for your home appliances, please see the Frequency Converter 50Hz to 60Hz, or Contact us. 7 kinds of Acc./Dec. time, time unit (minute/second) optional, max.Time: 6000 minutes. Control panel LED digital display Display setting frequency, output voltage, output current, etc. External meter display Display output frequency, output current, output voltage, etc. Parameter copy Function code parameters are able to be copied between inverters when use remote control panel. Protection function Over current protection, over voltage protection, under voltage protection, overheating protection, over load protection, etc. Optional parts Braking unit, remote control panel, cable, panel mounting feet, etc. Gozuk, an inverter manufacturer in China, recommends the installation of frequency inverters to soft start your motor in conjunction with a co monitoring system. When the co system calls for the fans, they will ramp up to between 30 and 50% speed. The fans will only ramp up again if the sensors are not satisfied with the reduction in co after 15 minutes of run time. We have found that 90-95% of the time, the slower speed is all that is required. What Benefits Can I Expect from Inverter? Inverters offer many benefits to reduce energy costs and extend the life of your mechanical equipment. Frequency inverters allow fan motors to run at variable speeds, based on demand, eliminating the power surge encountered when the device is simply turned on. When a motor is hard started, it will typically draw 600 to 800% of its rated current while it is accelerating. A motor started by a frequency inverter will be limited to 110% inrush current - in the worst case scenario. 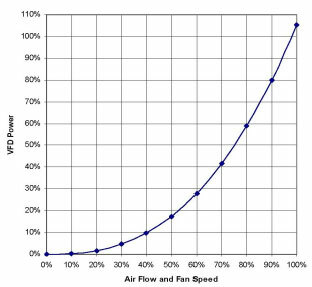 Additionally, by running a fan motor at 40% speed, you save approximately 90% of the energy cost associated with the motor operation. In the case of one 40hp fan motor, that translates to an additional 2,682.26 kw/h saved per year when used in conjunction with co controls. Another benefit associated with the installation of a frequency inverter is in the lessening of wear and tear and a longer life for your fan motor. From a mechanical standpoint, bearings run at lower speed will typically last longer than bearings run at full speed. Frequency inverter's inherently "soft start" the motor. This soft start extends the life of both the motor and bearings, and drastically reduces belt wear and tear. While these mechanical and electrical side-effects are many, they are often ignored because they are harder to quantify from a dollar and cents standpoint than the kWh savings which are easily measured. However, these benefits are real and can often provide savings as dramatic as the kilowatt hour savings. Many of our clients also find that installing a frequency inverter gives the additional benefit of noise reduction. Many exhaust fans are quite noisy run at full speed and may bother building tenants or guests. The installation of a frequency inverter can prevent noise by running the fan at a much reduced speed. Most fan motors used for ventilation do not need to operate at 100 percent capacity when called for by the co system to effectively ventilate the garage. Motors running unnecessarily at full speed can be a waste of energy and an unnecessary expense. How Can I Use a frequency inverter Effectively? Each property we have worked with has unique needs and situations which are solved by effective use of a frequency inverter. One of the most common is that an underground parking structure can become quite hot without the fans running. A frequency inverter can have the fans run at 10% power and circulate air to provide a cooling effect. This provides the desired ventilation without using the power running the fan at full speed would require. By working with AC Energy to determine what issues you would like to resolve, we can recommend a sequence of operations tailored to your building. Many utility manufacturers have started to provide incentives based on energy savings associated with frequency inverters. Be sure to check with your AC Energy representative to see if this may apply to you. Power factor is a ratio of real power -- what is used by the device -- to apparent power -- load present in the circuit. Power factor (real power/apparent power) is a dimensionless number between 0 and 1. Apparent power is the product of current and voltage in a circuit while real power is the measure how much useful work is produced in the circuit. A linear, pure resistive load will have a power factor of 1 versus an induction motor with a typical range of 0.70 up to 0.90. A frequency inverter can have a power factor as low as 0.60 if not corrected. Left uncorrected, harmonics created by a frequency inverter increase apparent power at a higher proportion than real power. Fortunately, however, methods exist to suppress harmonics in order to increase frequency inverter power factor. Technology is always the basic of a brand to survive in the market. China domestic manufacturers should establish their own research and development efforts to improve the frequency inverter technology level, creating new inverters to adapt to market demand. For a long time, China frequency inverter suppliers are in the low-end technology level among the global markets, but in recent years, the manufacturer realizes it's better to improve their own R & D abilities and production lines capabilities, rather than to emulate someone's technology. China inverter manufacturers establish their own R&D teams base on domestic market demand, build their own brand and increase market share, thus, compete with foreign frequency inverter brands in near future.